The sites listed below are aren't necessarily concerned with books or self-publishing - they're just ones I thought were interesting. Gnod (short for Global Network of Discovery) is a little like goodreads, in that it works on the principle of “if you liked this, you might also like…” - but it covers music, movies and art as well as books. 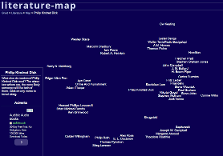 I particularly liked the “map” style presentation in the books, music and movies sections (see screenshot opposite). Click on the image opposite to take a look. I know that for some people, ambient music is the aural equivalent of watching paint dry - in which case this site is definitely not for you. 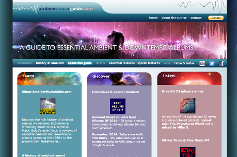 I'm fairly picky about what ambient music I like - but if you like any ambient music at all, this site is definitely worth a look. It's a real labour of love on the part of the author / webmaster, Mike Watson (or Mike G). Click on the image opposite to link to the site. Oblique strategies was a set of cards designed by Brian Eno and Peter Schmidt intended to be used randomly to prompt creativity – or just to avoid writer’s block. A tad pretentious? Maybe, but could be worth a try if you’re stuck in a rut - or just generally stuck with something. There are several website versions of the cards but I liked this one best. Click on the image opposite to take a look.